For the last leg of our journey, Adrianna and I traveled into Vietnam. I was a bit nervous before we arrived; America and Vietnam don’t have the happiest of relationships, and I felt concerned that it might affect our entry into the country and our reception there. I was wrong. 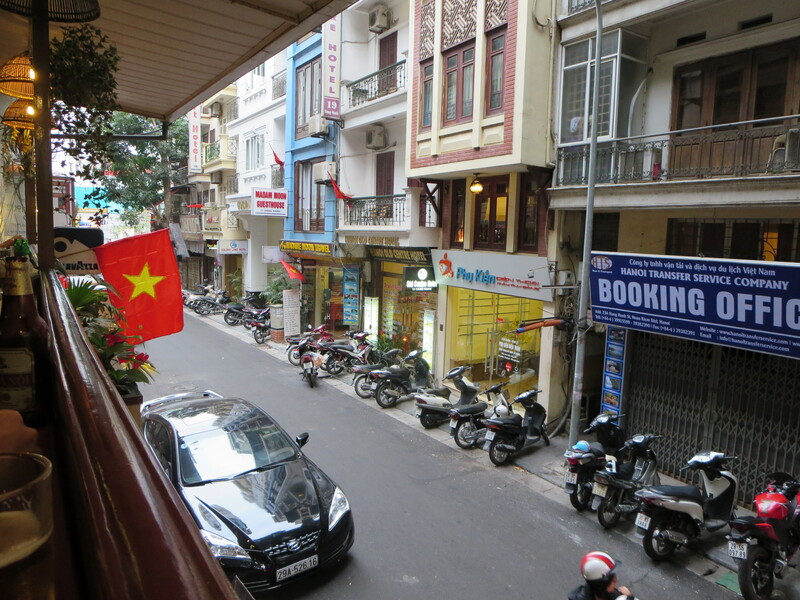 We breezed through customs pretty quickly, hopped into the waiting car (thanks, Hanoi Old Centre Hotel! ), and hit the city. It was about ten p.m. by the time we got into our hotel room, but we were more than a mite peckish, so we took a quick walk around to see what we could eat. The consensus was: not much. Not only was it late, so most of the restaurants were closed, but it was also only a couple of days until the Lunar New Year, which is the largest yearly celebration in China and Vietnam. Traditionally, families reunite in the homes of their eldest members, draining people from the cities–where we just happened to be staying–and turning densely populated metropolises into ghost towns. I was happy that we happened to be staying in the touristy part of the city, because some businesses were still open. 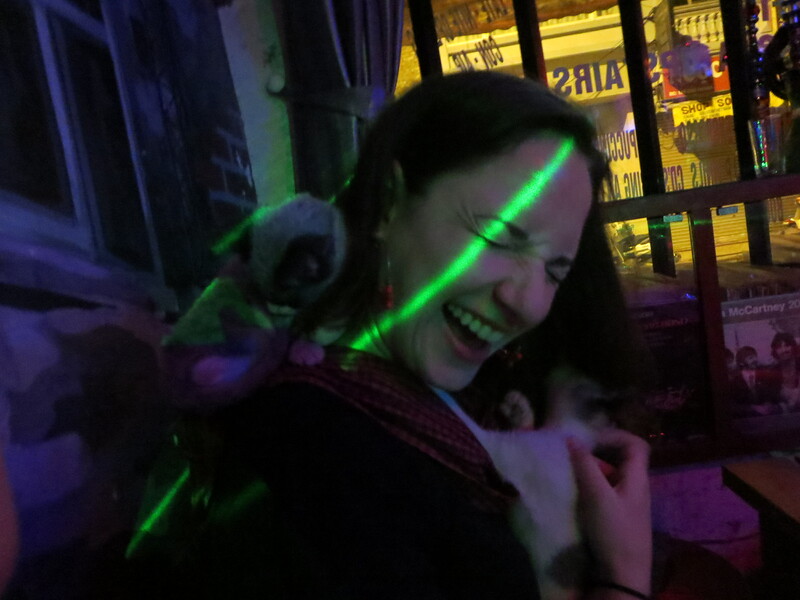 We eventually settled into a seedy little dive bar that reminded us a lot of home. The people there were very friendly, and a lovely women even brought out a couple of her kittens. Adrianna melted, and spent the next couple hours snacking on bar food, cuddling tiny cats, and liberally applying hand sanitizer. Safety first. The next day, I woke up early and asked our hotel staff how we could get to Halong Bay, where we would be spending night two in Vietnam. The receptionist told me there was a bus that was leaving in twenty minutes, and that if we didn’t catch this bus, chances are we’d have to take a private car for the three-plus hours required to get to the coast. We took the bus, even though it meant we had to cut short our first experience in Hanoi. Luckily for us, we were able to get back a few days later and really experience a little bit more of that wonderful city. 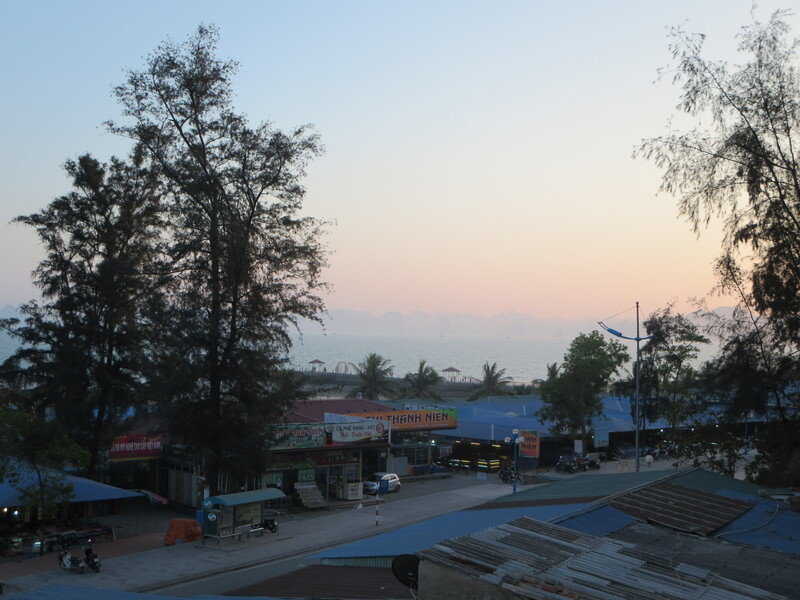 After a four hour bus ride, we landed in Halong Bay to…emptiness. The city, at least where we were staying, was deserted. Most of the shops and restaurants were closed, and besides the hotels, a few market stalls, and the tourist havens, the city seemed abandoned. We walked around a little bit before getting dinner. We had some fresh seafood that Adrianna liked and I thought was…questionable. Mantis shrimp was the main culprit, as I found it to be pretty bland and way to difficult to eat, while Adrianna had no problems whatsoever ripping those little crustaceans into pieces. After dinner, we retired early, preparing for day two, and the cruise we had booked earlier. The cruise was fun! The scenery was beautiful, and the ride over on the boat was very peaceful and enjoyable. Halong, in Vietnamese, means “descending dragon,” due to the unique rock formations that mimic the image of a dragon’s tail as it descends into the oceans depths. It’s quite a spectacle, made no less awesome by the presence of dozens of small, floating homes, where people go about their daily lives despite the constant attention they receive from millions of awestruck tourists. Did I say millions? Because there were lots of tourists. 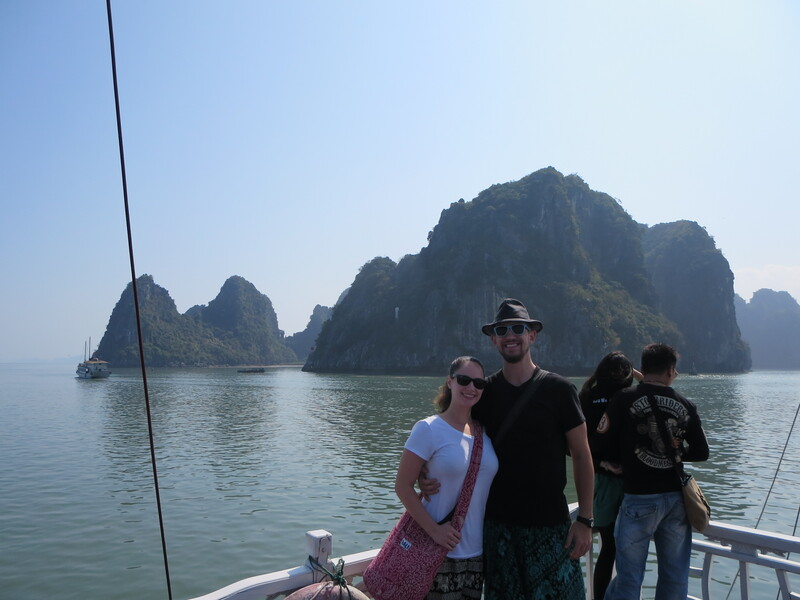 Adrianna and I tend to avoid tourist groups as they don’t really support our independent spirit, but it was the only reasonable way to see Halong Bay. We didn’t hate it, but we definitely would have preferred to do it a little differently. We felt rushed here, stalled there, and generally pressured to keep with the group. Not our cup of tea, especially when you’re talking about appreciating grand vistas. It’s hard to develop the sense of serenity–that usually comes easily at such locations–when you’re playing a game of follow-the-leader behind a group of rowdy Australians. Inside the boat, with other tourists. After about four hours at sea our junk returned us to the dock, and our empty city. We wandered around some more (typical us), got dinner, and eventually ended up in a quirky little bar about a five minute walk from the hotel. That night was the official start of the Lunar New Year (the celebration can last for about two weeks before and after the official day), so the only customers that joined us were other tourists. We met some lovely young Chileans and a pair of Spaniards, most of whom (fortunately) spoke English. We had a few beers, played some pool, and laughed together until late in the night. It was a really pleasant night, and I’m glad we were able to make some travel buddies. The next day we woke up and decided to do nothing. Nothing is what we did. We took the day as a rest day, which was necessary, since we had already done just about everything worth doing near our hotel. We slept late, ate early, and packed so that we could catch a bus back into the big city, Hanoi. I’m going to end my narration here. 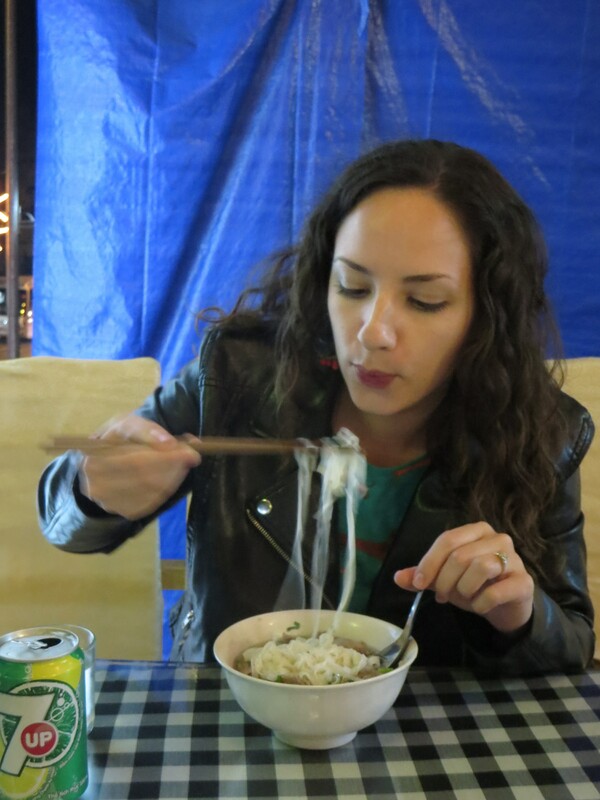 This blog post is starting to run a little long, and I think the time we spent in Hanoi, as brief a period as it was, deserves some special recognition. So, until then, Happy New Year! I love this blog! And I am impressed by your diligence in continuing to organize pictures and write everything out! Some bloggers get tired and give up! This will be a treasure for you to look back on.